The life and times of four Poskozim's living (and growing) under one roof. 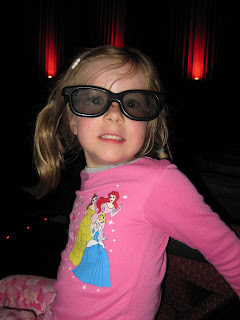 While Adam was at the cabin last Sunday, I took the girls to see the 3D version of Up. First of all, I was completely shocked at how much it cost us. Apparently you get charged for an adult price ($9) for each person regardless of age! Add to that the price of popcorn and a pop for the 3 of us to share and I was feeling pretty broke by the end of the night. Addie was completely fascinated with the movie. She jumped when things popped out of the screen and ohhhed and ahhed at the heights that the house floated to. Lily was a little less impressed. She almost immediately got her 3D glasses all smudged and yucky. 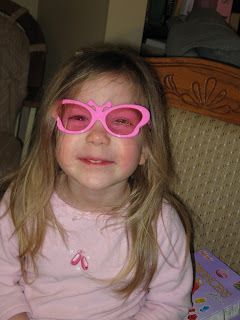 She ended up taking them off and watching the movie without them until the end when I swapped glasses with her. In her defense, One Size Fits All glasses do not fit Lily. I'm not entirely sure that she could see out both lenses. The movie was good though. I was a little worried that Addie would be scared by the dogs at one part (Lily really wasn't into the movie enough to get scared) but it really didn't faze her much. I would be cautious if you have a child who is easily scared. Like most Disney movies these days, there are enough jokes that just the adults will get to keep parents entertained. Over all, it's a sweet funny movie about a man trying to fulfill a dream that his wife had always cherished. ... at 4:30 in the morning you are laying in bed composing your blog post for the next day. I was woken out of a dead sleep by little Lily at the side of my bed asking for her animal pillow. I reached down to pull her into bed with us when I noticed that she was completely soaked and cold. Apparently the half a glass of pop she had shared with me at McDonalds that night had gone right through her. I got her changed into dry footie jammies (because nothing else will do these days) and put her into bed with Adam. I then began the hunt for clean sheets. Everyone knows my saga with laundry and the never ending battle that we fight to get the laundry done and put away. Well, I've failed. I cannot find a clean crib sheet. OK, I'll put sheets on the queen size bed in her room. But wait, there are no clean blankets for she's peed on all of them in the last week. Into the deep upstairs closet I go, looking for a blanket that hasn't seen the light of day in at least a year. I finally found some that might be acceptable to our picky kid. I take the sleeping Lily out of our bed (because I really don't want her to pee in that bed too!) and bring her into her room. She was very upset to be taken out of Momma's bed. I finally got her settled down and sleeping and went back into my bed at 5am. I'm not sure it was worth going back to sleep. 1. We went from bright and sunny shorts weather yesterday to cold and sunny today. Yech. That's just the way it's been lately. 2. 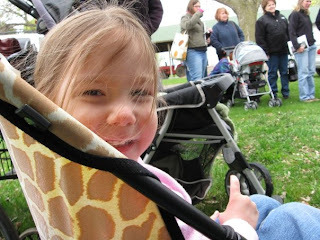 Over Mother's Day weekend my sister and I took the girls to the Shepard's Harvest Festival. My sister snapped a bunch of cute photos including this one. 3. We finally have Lily Pull Up free at night. She's been potty trained for a long time now, but we continued putting the Pull Ups on at night. I finally realized that she was staying dry at night but didn't want to get up in the morning and go into the bathroom so was using the Pull Up out of shear laziness (or crankiness if you want to get right down to it). 4. Addie's last week of 4K is next week. She's got a month of Kindergarten Camp this summer to look forward to, then it's real Kindergarten in a new school. 5. Addie finally passed into the next swim class level. She'll be a Starfish. It's nice because that forces the girls to be in separate classes which I think will be good for them.